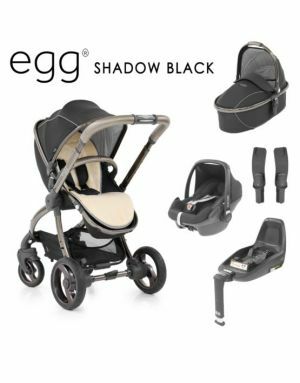 The Shadow Black egg Stroller Bundle includes Chassis, Seat Unit, Carrycot, Cream Fur Liner, Car Seat Adaptors, Maxi Cosi Pebble Plus and 2Way Fix Isofix Base. TWO-WAY RECLINING SEAT - The curved seat is suitable from six months. It has 3 recline positions and can be positioned to be front or parent facing. The seat is beautifully finished with a stylish leatherette swing away hinged bumper bar. ADJUSTABLE LEG-REST - The pivoting adjustable leg-rest allows you to easily support your child’s feet as they grow, and also incorporates a discreetly placed insect net underneath. ADJUSTABLE HANDLE -The beautifully finished hand-stitched leatherette handlebar has 5 adjustable height positions, adjusted by a rotating barrel. ADJUSTABLE CANOPY - Made out of soft, luxury fabrics, the egg hood has a silent and smooth fold to 3 adjustable positions. The hood can also be moved to higher positions up the chassis if needed. TRU-RIDE TECHNOLOGY® TYRES - The unique solid non-puncture PU rubber ‘Tru-Ride Technology®’ tyres are lockable at the front with a ‘step on step off’ brake making the stroller extremely easy to manoeuvre. STORAGE BASKET - The large storage basket at the base of the egg stroller provides easy access from the front and rear. 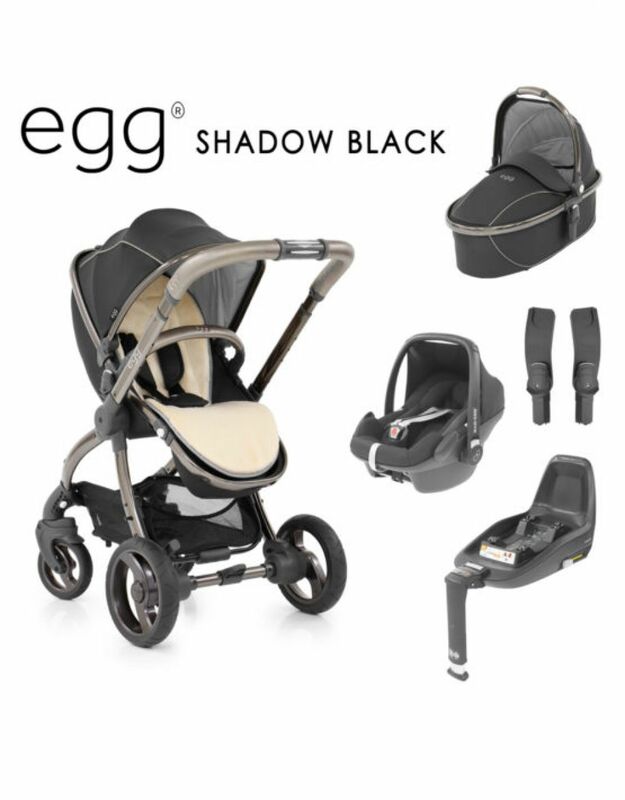 ONE HAND FOLD - By simply rotating the barrel on the egg and lowering the handlebar down releases the chassis allowing the stroller to be folded into a compact free standing unit by lifting a central carrying strap which is attached to the storage basket. The egg Stroller weighs 13.5kg and the chassis folds to a compact size of 67 x 29 x 59 cm. TRAVEL SYSTEM COMPATIBLE - The egg stroller converts into an all in one travel system.